THE PICKIEST EATER IN THE WORLD: IT'S OFF TO GRAMS DINER WE GO! When they picked me up, they were, of course, expecting me to have set plans for dinner already. Unfortunately, all of my suggestions were rejected because I had forgotten that both Rina and Chaikka have a "No Rice? No Thank You" policy when it comes to restaurant choices for dinner. 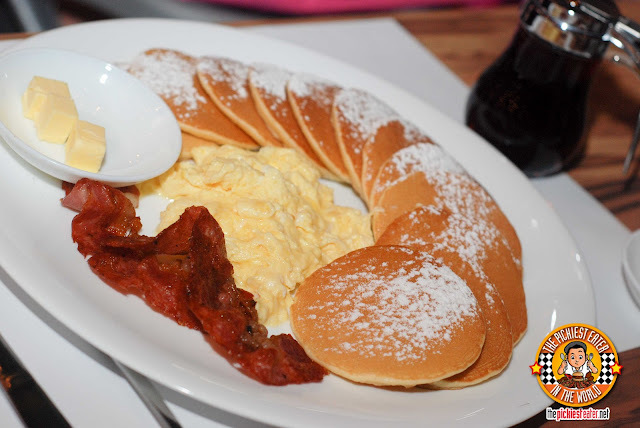 As we entered Bonifacio Global City, I realized that a Diner that I had been wanting to blog about had conveniently opened near the MC Home Depot area. All the two sisters had two hear was the word "Diner", and they were sold.. We were going to have a "Late Night Breakfast" at Grams Diner. Gram's Diner doesn't look like any diner I had ever seen before. Gone are the 1950's Americana decors that are so prominent in other diners I've been to in the past. 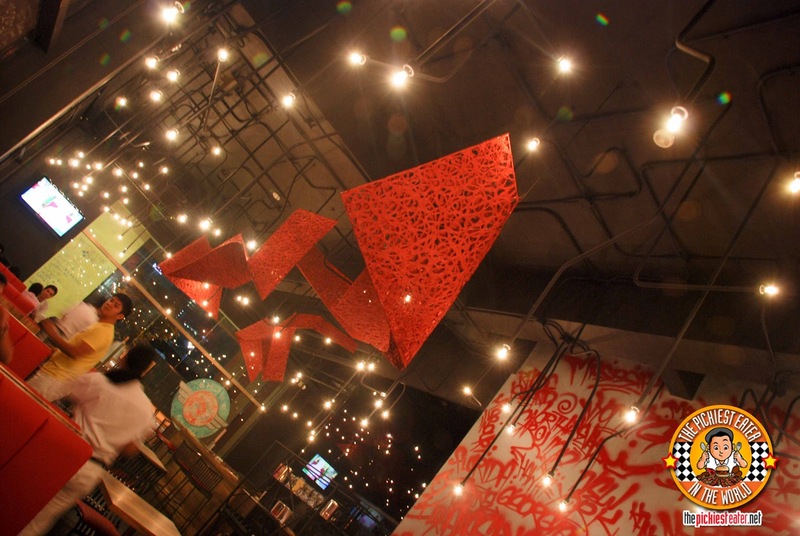 In its place is a modern abstract designs hanging from the ceiling, and a wall full of incomprehensible spray painted graffiti. Something I've got to say outright, is that their waiting staff was amazing. talk about going the extra mile.. They saw we had a baby in a stroller with us, and they did everything in their power to make sure we were comfortable.. and that includes one of them taking us to our car in the nearby parking lot, while shielding us from the pouring rain with an arsenal of umbrellas. I almost went to Gram's Diner last year during my trip to the South with Rina and her friends, but we ended up eating at the neighboring restaurant, The Wooden Horse Steak House instead. No regrets, because I really wanted to eat a restaurant that would be exclusive to the South. 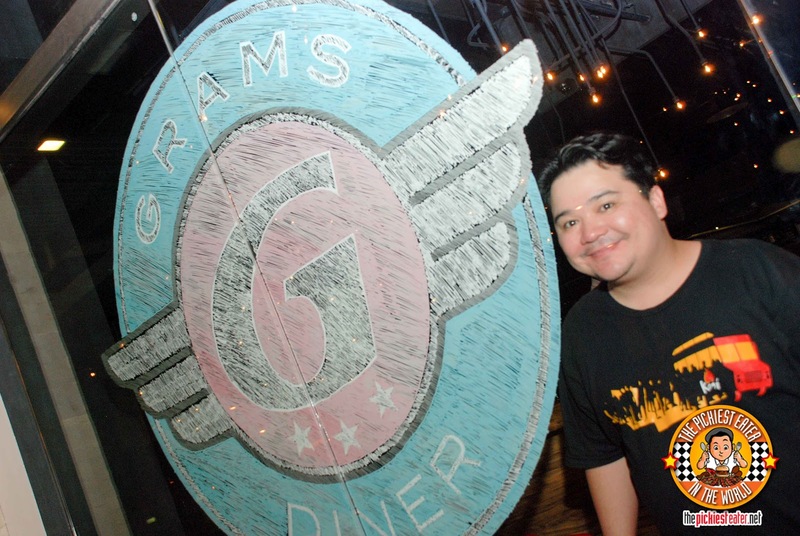 Grams Diner at that time already had branches in MOA and an accessible one in Rockwell. When Rina, Chaikka and I started glancing through their new "Menuzine", it became clear that even though it was 9 in the evening.. we were going to order the same type of food.. BREAKFAST. Rina's favorite scene in the movie "Twister", isn't the amazing computer generated hurricanes. It wasn't cars flying around in the wind, either. It was the scene where they were eating Steak and Eggs at Aunt Meg's. Ever since she saw that movie, the mere thought of steak and eggs sends her into an insatiable craving that would make Count Dracula crawl back in his coffin in shame. So when she saw the picture of "Never Too Early For Steak" (P450) in the menu, she was a goner. I knew that even if she said she was ok with choosing something else, deep down that said craving needed to be quelled. 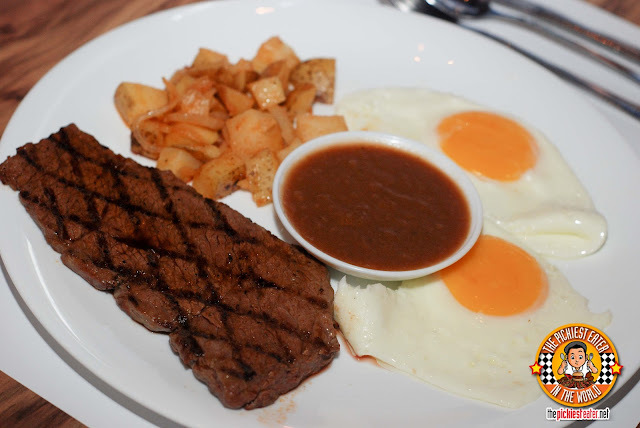 The Never Too Early For Steak consists of an Angus Beef Denver Steak, Two Eggs of any style of your choice, home fries and Gravy. The Denver was grilled immaculately, with the char marks creating beautiful crisscross marks across the meat. The gravy had a delicate creaminess to it went perfectly with the steak. In all honesty, the steak was delicious but the Denver Cut had a lacking of fat in my opinions. Also, I was looking forward to the Home Fries, but sadly, they were under cooked. The flavor would've been fantastic had the potatoes not been a bit too hard, almost to the point of being crunchy. 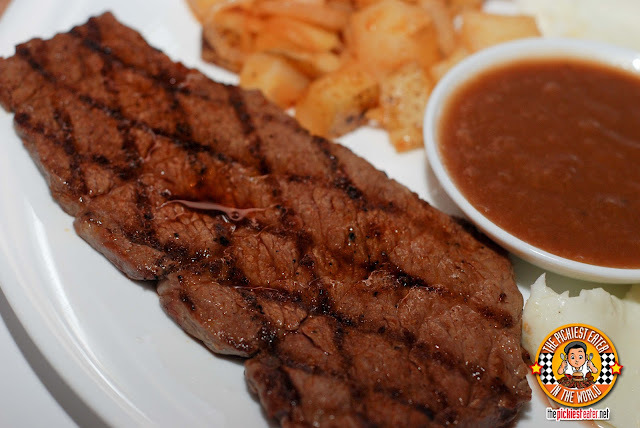 True to its name, I can't imagine it ever being too early to devour this steak. It takes a lot of Cajones to name a dish after your establishment, let alone declare that it is "World Famous". 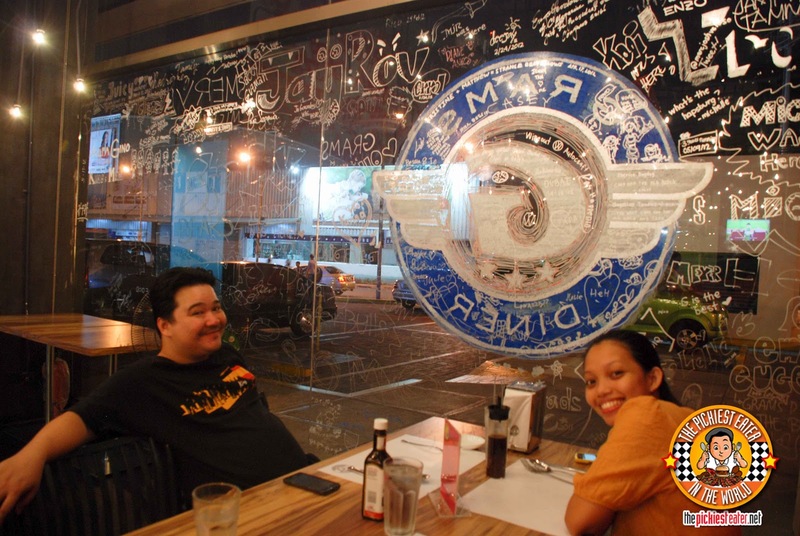 So I admired Grams Diner's bravado in naming their tapa dish, Grams Diner's World Famous Beef Tapa (P255). I've tried a lot of beef tapa in my time, and my standards for it are really quite high. Since it was supposedly their best seller (and there was a promise of garlic rice), Chaikka decided to give it a try. I can safely say that Grams Diner's Beef Tapa knocked it out of the park. 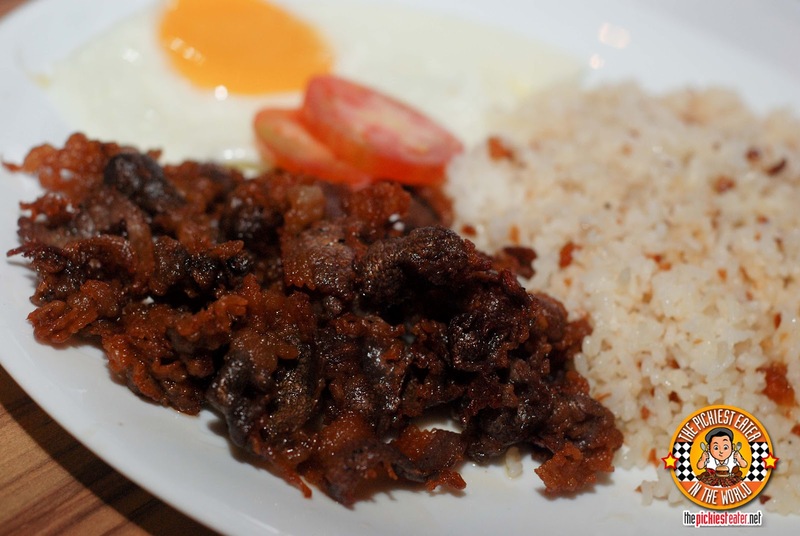 This tapa is so good, its self proclaimed worldwide recognition is very much deserved. The Fat to Meat ratio is just right, and its crunchiness gives you the impression that the meat wasn't so much fried, as it was "toasted". Flavors just really swirl in your mouth of meaty goodness, and the garlic fried rice is a perfect partner. Definitely one of the best Beef Tapa's I've ever had. I ordered the Burstin' Breakfast (P360), which consisted of Two strips of Bacon, Two Strips of Ham, Two Sausage links, Two eggs, toast, and Home fries. Both the Ham and Bacon had excellent flavors, but.. umm.. sorry.. could have used a bit more fat in my opinion. I would have preferred if they swapped breakfast sausage for Country Sausage, because the breakfast sausages tasted closer to little franks.. or little hotdogs.. good but nothing truly mind blowing. Otherwise, it was a hearty, very filling breakfast! For "Dessert" I ordered the "Riddles from The Griddles" (P230), which consisted of scrambled eggs, bacon, and 12 Silver Dollar Pancakes. The Bacon was the same from the Burstin' Breakfast. Something I noticed though, was that the fried eggs for all the other dishes were cooked perfectly, while the scrambled egg had a nice, slight runniness that I like in my eggs (Was it me or did that sound weird? ), but lacked a few pinches of salt. The Silver Dollar pancakes itself had a delicious mix of sweetness and creaminess, but I found it a little bit drier than I would have preferred. Without a shadow of a doubt, the best thing I tried in Grams Diner had to be the Tapa. That is something I would definitely go back for, and would recommend everyone to try. 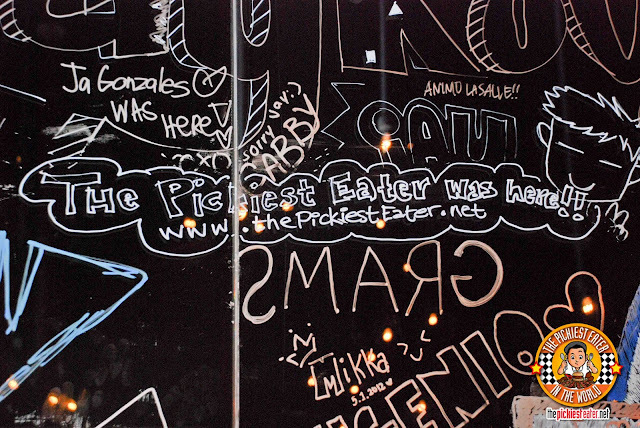 In keeping up with their graffiti theme, the waiters urge customers to write on the glass windows special messages about their experience. 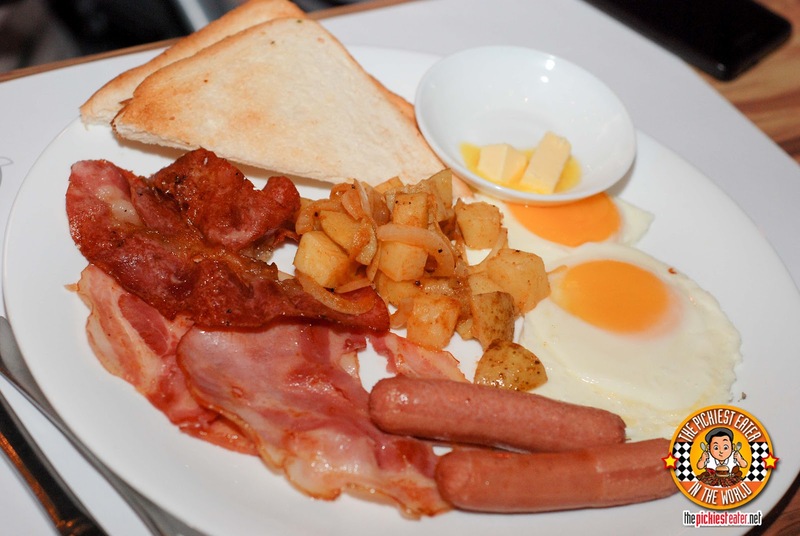 Check out Grams Diner Menu Here! good thing you blogged about it. at leats now i know what i should order. we've been wanting to try it out! Oh yeah I've tried their lunch specials before. That grilled barbecue chicken was quite tasty :) ! Back in their Rockwell branch, a staple in my order was the "Mugnanimous". A large mug of beer with a flexed bicep for its handle. It's so...... me :D ! haha yeah they might as well called it the "Raynanimous"! Thanks Justinne! I'm going to some of the places you suggested within the next couple of days! thanks again! awesome site! you bet, carnivores rock!! haha thanks for the msg on bloggers.. i barely check that profile, and I actually forgot I had one hehe.. Since Baby Rain is a direct result of my actions, and the food is not, I must say that your comment made me very proud hehehe.. I wanna try their Eggs Benedict.